GE Research, the R&D wing of American conglomerate GE, has used 3D printing to design an ultra-efficient, low-emission heat exchanger for power generation equipment. Called UPHEAT (Ultra Performance Heat Exchanger enabled by Additive Technology), the heat exchanger is part of a $2.5 M project led by GE Research. The project was established through the Advanced Research Projects Agency’s (ARPA-E) High Intensity Thermal Exchange through Materials and Manufacturing Processes program (HITEMMP). In it, GE Research collaborated with University of Maryland (UMD) and Oak Ridge National Laboratory (ORNL). Over the course of two years, the collaborators aim to “develop a high temperature, high pressure and super-compact heat exchanger that would enable cleaner, more efficient power generation in both existing and next generation power plant platforms” using 3D printing. “We’re taking our deep knowledge in metals and thermal management and applying it in ways we couldn’t have before through the power of 3D printing,” commented Peter deBock, a Principal Thermal Engineer for GE Research and project leader on the ARPA-E award. Laura Dial (Materials Scientist at GE Research) and Peter DeBock. Photo via GE. The UPHEAT heat exchanger is made from a nickel superalloy designed by GE Research specifically for additive manufacturing. The material is capable of withstanding high temperatures and is crack-resistant. ORNL, a specialist in corrosion science, will test and validate the long term performance of the materials used. Upon completion, the heat exchanger is expected to provide increased thermal efficiency of indirect heated power cycles, with reduced energy consumption and emissions. It will be capable of operating at temperatures up to 1,652 °F (900°C) and pressures up to 3626 psi (250 bar). With these properties, the UPHEAT could enable advanced applications in power and aerospace towards more energy efficient processes. Prototype of 3D printed heat exchanger. Photo via GE. GE Research, formerly known as GE Global Research, is currently part of a project funded by national 3D printing development partner America Makes to develop a commercial-grade, metal additive manufacturing system in collaboration with Lawrence Livermore National Laboratory (LLNL). Funded by the U.S. Air Force Research Laboratory (AFRL), the project is part of the Acceleration of Large-Scale Additive Manufacturing (ALSAM) scheme from America Makes. The research and development division has also developed a process for creating 1:1 scale twin digital models of metal 3D printed parts for the U.S. Navy. Through the digital twinning process, the Navy will depend on GE to accelerate the production of mission-critical equipment. GE Additive has been nominated for the third annual 3D Printing Industry Awards in the OEM of the year (Enterprise) category. You can cast your vote and help decide this year’s winners now. 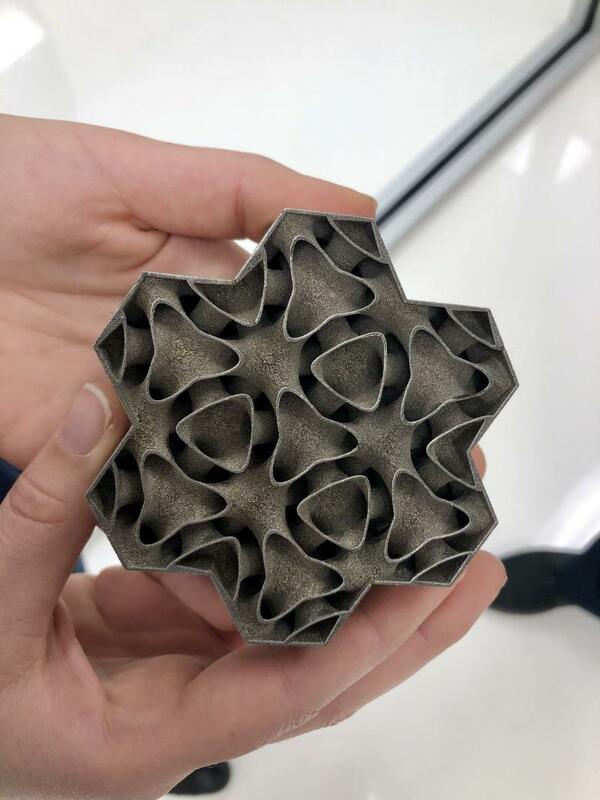 Featured image shows prototype of 3D printed heat exchanger. Photo via GE.